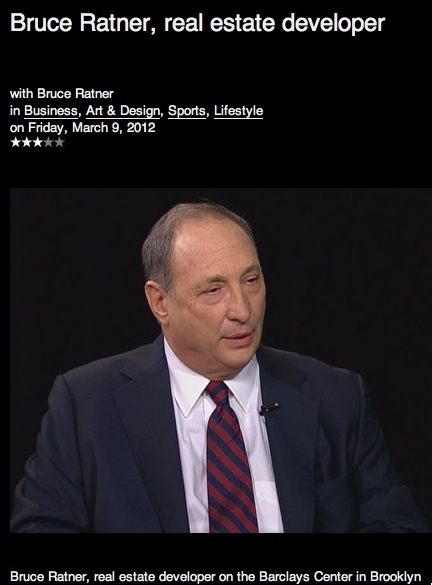 For Bruce Ratner, Brooklyn’s most powerful developer, March 9, 2012 represented a coronation of sorts: he appeared for the first time as the guest of elite interviewer Charlie Rose. The host was ready to fawn over several Forest City Ratner-built projects: the MetroTech office complex in Brooklyn; the residential tower 8 Spruce Street in Lower Manhattan (marketed modestly as “New York By Gehry”), and the in-construction Barclays Center basketball arena in Brooklyn, slated to house the NBA’s Nets this fall. Ratner, beaming at the softball questions floated by the host, suggested that, unlike himself, most other developers eschew “civic” development but “look at more, I think, the economics." To those who know Ratner’s controversial Atlantic Yards project, which includes the arena and 16 planned towers, the developer’s claim was a hoot. Why else would Brooklyn not yet have seen the much-promised Atlantic Yards affordable housing (and most of the jobs) if not for “the economics”? The coronation would have been further complicated had Rose noticed a federal corruption trial ongoing in Lower Manhattan, during which Forest City Ratner was seeing its business practices under a microscope. No, the defendants did not include Forest City Ratner, an arm of the Cleveland-based Forest City Enterprises (FCE) which specializes in tricky mixed-use projects that require public-private partnerships. However, in its desperate effort to get its 81-acre Ridge Hill retail/residential project past the Yonkers City Council, Ratner’s firm had rewarded a fixer--a clear case of looking at “the economics.” FCE and its subsidiaries are no stranger to aggressive lobbying and strategic spending (note this Cleveland Plain Dealer report), but this time Forest City Ratner seemed to cross a line--an ethical one, if not a legal one. Shortly before the trial, the two key Forest City executives expected to testify, government relations chief Bruce Bender and his deputy Scott Cantone, let it be known they were leaving to form a consulting company. Was this a purge, or perhaps damage control? Given the duo’s subsequent testimony--how Forest City hired a Yonkers operative for a no-show job after he helped get a City Council Member to flip her vote on Ridge Hill--their departure didn’t look routine. Rarely does the development dance get described in such excruciating detail, complete with profane email messages and hold-your-noise hiring. This was the Culture of Cheating--no, not for Atlantic Yards, but with the same developer and many of the same players. As the trial proceeded, Crain’s New York Business columnist Greg David, generally a friend to developers, commented that Forest City Ratner must be relieved that its “See no evil, hear no evil” posture in Yonkers got so little attention. About six weeks after the trial began, on March 29, the fixer, Republican Zehy Jereis, and the Council Member, Democrat Sandy Annabi, were convicted on all counts, including the giving and receiving of corrupt payments and, in the case of a second project, extortion. Whatever the verdict, as David suggested, Forest City Ratner’s reputation had already been tainted--and far more than when the indictment emerged in January 2010. Some beneficiaries charged; was FCR "bilked"? According to that indictment, Jereis had given Annabi more than $160,000 over seven years, including down payments for real estate and a Mercedes-Benz, and paid her student loans, utility, and cable bills. (The total rose to $194,000 at trial.) In turn, she delivered when he asked, flipping her vote on Ridge Hill, as well as that second project, Milio Management’s Longfellow. Also charged was Anthony Mangone, described (with Jereis) by a local columnist as “part of Westchester's incestuous political underworld.” Mangone, an admitted liar, gambling addict, and substance abuser with a whiff of Mafia connections, would later plead guilty to bribing Jereis to get Annabi to change her vote on Longfellow. The Milio family, small-time developers who later pleaded guilty to tax charges, would testify at the Annabi/Jereis trial and admit they regularly “tipped” municipal workers to ensure good service,. The federal indictment,, however, merely sketched the sequence of events, leaving the awkward details of Forest City’s involvement--and Jereis’s dramatic but dubious explanation for his payments to Annabi--to be described at the trial. Forest City, the biggest beneficiary of the scheme, was not charged in the indictment, and a spokesman stressed that the firm was not a target of the investigation. In the New York Times’s oddly generous locution, the developer was even said to have been “bilked” by Jereis. Forest City hardly sounded like a victim. Given that the developer got a green light on a project slated to cost more than $600 million, in part thanks to Jereis, it sounded like the reward to him--a brief $5,000/month consulting job--was money well spent. After all, Forest City routinely dispenses far more on lobbying. Through June 2005, a year before the Council vote, the developer’s Ridge Hill lobbying tab already topped $200,000, according to the Journal News. Thus, it seemed, Forest City had gotten lucky: not only did it escape sanction, it continued to save tens of millions of dollars from a zoning change and negotiated tax cap that, according to prosecutors, had been wrongly gained. For two years, Forest City claimed it was clean. Not until the trial did it have to explain the no-show job it handed Jereis shortly after Ridge Hill passed. Yonkers, just north of the Bronx and the fourth-largest city in the state, saw its industrial base decline after World War II, as with many older cities. The smaller, more exclusive suburbs blossomed. So Yonkers leaders scrambling to revive the tax base have been receptive--perhaps too much so--to developers’ plans. Yonkers has had much to surmount. Racially balkanized and poorer than most of Westchester County, the city took 27 years to resolve a federal housing discrimination lawsuit filed in 1980. All along, the local tussles for governmental influence provoked an tawdry tagline: “the City of Hills where nothing is on the level." Annabi, a Yonkers native with a criminal justice degree and an administrative job at a local hospital, was a fresh face, barely 30 when she first ran in 2001. In her part-time Council gig, Annabi pledged, she’d help make the streets of her working-class district cleaner and safer. 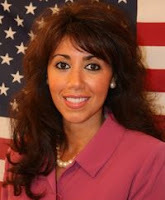 Though Annabi’s Jordanian Christian family was once described in the Westchester-based Journal News as having “the prototypical immigrant family experience,” with her dad running a supermarket and her mother tending the home, that sketch omitted a dissonant detail: both parents had been involved in heroin smuggling when their daughter was a pre-teen. Jereis, Chairman of the Yonkers Republican Party and a veteran of street-level campaign work, served as Annabi’s political mentor, even though she was a Democrat, a relationship that perplexed some in her party. But they were distant cousins, and Jereis helped Annabi triumph in a district with a Hispanic plurality. Jereis had key connections in Yonkers politics. For several years he worked, as did original co-defendant Mangone, for an only-in-Yonkers pol, Sen. Nick Spano, a Republican who’d retained his seat in an increasingly Democratic district by delivering pork--and, as the trial revealed, not without playing dirty. Jereis had been controversial well before he met Forest City. According to Mangone, testifying under a cooperation agreement, Jereis left Spano’s employ, because of October 2005 testimony by an Albanian gangster, Mo Sanginiti, who said he’d paid Jereis to help scotch an investigation. That was to be accomplished by working through a powerful local Republican, Albert Pirro, a once-disbarred lawyer who was husband to Jeanine Pirro, the Westchester District Attorney, and had done federal time for tax fraud. Spano got Jereis a job at the Yonkers Chamber of Commerce, ostensibly lobbying to bolster funding for the Chamber. Jereis did virtually nothing, according to the Chamber head, who acknowledged he didn’t try to fire Jereis. Then again, Spano had promised to fund Jereis’s position through a “member item,” but that never came through. Jereis, who as of the trial was managing a gas station in a tough part of Brooklyn, told a different story on the stand. He was in love with Annabi, ever since he saw her in a “summer blue dress” and became her political mentor. And however beefy he appeared, he’d gone through an extreme makeover, losing 150 of 400 pounds and getting his teeth fixed. Annabi, slim and with long poufy dark hair, wore high heels, heavy eyeliner, and ladylike attire to the courtroom--not implausible support for Jereis’s claim, at least if no other witnesses testified. Sphinx-like during five weeks of testimony, Annabi never took the stand. But, in video of City Council sessions aired at the trial, Annabi sprung to life, an earthy populist. And she was Forest City’s roadblock. Forest City, which announced Ridge Hill in 2002, had the support of four of seven Yonkers City Council members. As of 2005, however, the firm needed a fifth vote because of a supermajority requirement imposed by a conflict with Westchester County. At the trial, a leading political opponent of the project, former Council Member Dee Barbato, testified that Forest City got a sweetheart deal: another shopping center about one-third the size of Ridge Hill pays more than twice the property tax Forest City had negotiated. Ridge Hill, however, offered hope for Yonkers to make a turnaround. So the four project backers on the Council broke the logjam: they overturned the supermajority requirement. Annabi and allies fought back, filing a lawsuit that, in May 2006, was successful in nullifying that move. Annabi seemed like a die-hard. So, when in mid-June, Annabi announced her support for the project, she surprised “nearly everyone,” according to the Journal News. Only with the 2010 indictment did the public learn how that had been orchestrated: Jereis had organized Annabi’s two meetings with Forest City prior to the vote and also asked the developer for a job. In October 2006, as the indictment explained, Jereis signed a $5,000/month contract with Forest City to serve as a "real estate consultant," though he had no experience in the field. The contract was backdated to August 1. Jereis began getting paid, despite doing little if any work. Only on March 12, 2007, after news reports about the federal investigation surfaced, did Jereis submit the required monthly reports regarding his work, according to the indictment. "We know that everything we did to advance Ridge Hill Village was done properly and legally and are not worried about what any investigation might turn up," Forest City Ratner spokesman Loren Riegelhaupt said at the time. After the investigation surfaced in 2007, Jereis was the first name publicly mentioned, prompting the Journal News to remind readers of his curious career: a history of government jobs controlled by the Republican Party and also encounters with the law, which involved an election law violation, a misdemeanor drug conviction (pled down after being charged with selling a pound of pot), and the Sanginiti allegation. Annabi, who at that point had not been named in the investigation, spoke up for Jereis, calling him "a great man,” and adding, “We have a very close relationship.” Exactly how close would be debated fiercely in the trial five years later, and never quite resolved. Not making eye contact or expressing any alliance in the courtroom, Annabi and Jereis nonetheless were seen to cordially converse outside of court. Their lawyers collaborated frequently. Forest City, as its executives acknowledged during testimony, was in a tough spot prior to Annabi’s change of mind. It had invested some $70 million in its ambitious Ridge Hill plan, which would bring an upscale mall and other buildings to an irregular site once home to a drug treatment center and a defense contractor’s R&D center. It had hired top lobbyists, apparently with no great concern about ethics: one was Albert Pirro. Also enlisted was Mike Spano, brother of Nick, a former Assemblyman working for Patricia Lynch Associates, a powerhouse firm run by the former top aide to Assembly Speaker Sheldon Silver, one of the “three men in a room” who dominate state politics. Neither man could get Forest City a meeting with Annabi, but they tried. Mike Spano, on the stand, testified that Jereis had acted manipulatively. While driving with Spano to Annabi's house, Jereis appeared receptive to getting Annabi to support Ridge Hill, but inside, Jereis took Annabi's side, resisting the project. "What was that all about?" Spano said he later asked Jereis. "He indicated that Sandy needs to trust me." On September 25, 2005, however, Spano could only report frustration to the man who hired him, Forest City’s Bender, who had served as Chief of Staff to one-time New York City Council Speaker Peter Vallone and had come up through the ranks of the Thomas Jefferson Democratic Club, a powerhouse South Brooklyn political club. "I've taken every angle with this Sandy,” the lobbyist wrote. “I have Nick [Spano] involved, Zehy [Jereis], and Anthony [Mangone]. She has not moved. We have union heads talking to her too. We are still working it." On the stand more than six years later, Bender, already departed from Forest City, seemed subdued. He was neither the elaborately solicitous Atlantic Yards booster featured in Battle for Brooklyn, talking up the “arenar” in his deep Brooklyn accent, nor the foul-mouthed dealmaker evident in the BlackBerry message or caught on wiretap with disgraced Brooklyn Sen. Carl Kruger, who in early 2012 pleaded guilty to taking bribes, though not from Forest City. To “close this,” Bender needed to meet with Annabi, and that wasn’t easy. Forest City’s Cantone approached her at a Council meeting. No dice. Bender called her at work; she hung up on him. Did Annabi explain why? "Initially, no," testified Cantone, a veteran of not just Forest City but the administration of New York City Mayor Rudy Giuliani, where he served as director of legislative affairs. The Council Member later said, in Cantone’s telling, "You heard my objections to the project; there's really no reason to meet." Forest City, Cantone said, had been told that “all roads to Sandy Annabi go through Zehy Jereis." But it had not taken that route initially; Cantone blamed Yonkers’ “crazy” politics, with intra-party squabbling. "We did not want to offend [other project] supporters," he said. Lentol was an old friend of Joseph Galimi, a former Yonkers official rumored to have organized crime ties. (Such rumors have also dogged Lentol, who once wrote a letter urging bail for a mobster charged with murder.) Galimi had brought Jereis to meet Lentol at Tiro A Segno, “New York’s premier Italian heritage club,” located in Greenwich Village. When the three talked Ridge Hill, Jereis agreed to meet with Forest City. For the lunch, Galimi chose Marco Polo Ristorante in the Brooklyn neighborhood of Carroll Gardens, a rococo joint with its own whiff of made men, Bender and Cantone picked up the bill for the Tiro A Segno trio. The $227 lunch, with a $50 tip, was a good investment. Bender recalled how, at the lunch he asked Jereis why, as he believed, Jereis opposed Ridge Hill. Jereis said that wasn’t so, adding, in Bender’s report, "Maybe you just hired the wrong people." (Jereis testified he didn’t remember saying that.) At the end of the meeting, Jereis asked for a job. So too did Galimi, via Lentol. Forest City ignored him, and he didn’t follow up. They couldn’t avoid Jereis, however, whom they would see twice in the next weeks, with Annabi. Bender, Cantone, and Richard Pesin, the executive behind Ridge Hill, then visited Yonkers and nearby Riverdale for two meetings. Annabi didn’t turn easily, in their telling; at one point, she and Pesin left after an argument, leaving Bender, Cantone, and Jereis to negotiate. Ultimately, according to their joint account, Annabi agreed to change her vote because Forest City agreed to an additional $10.8 million in PILOTs (payments in lieu of taxes) over three years, a sum Bender cleared directly with Bruce Ratner. Bender acknowledged that Forest City did not make any concessions that had not been previously offered. Nor did the developer create the “education fund" that Annabi requested, and the Council Member never followed up. That may have been murky evidence of corruption, as Annabi’s lawyer argued, stressing there was no direct evidence that the money changed her vote and there was no explicit corrupt agreement. But Annabi wouldn’t have been meeting with Forest City without Jereis, and the Forest City executives were primed to reward him before she voted. Jereis, mired at the Chamber of Commerce, still wanted a job. And after Annabi publicly announced her support in mid-June, he sent his resume again to Forest City. Cantone put him off, asking for more information about his business. Jereis soon sent his Social Security number and the business name ZJ Enterprises. The developer’s men admitted they were in a tough spot, aware that “optically” it would look bad to hire Jereis, but unwilling to blow him off, concerned that it might scotch Annabi’s vote. "We were caught between a rock and a hard place," Bender suggested. Had they promised Jereis a job before Annabi’s vote? "It was inconclusive," Bender replied, "but we certainly left the impression we were probably going to do it." Jereis, in Cantone’s words, was “persistent.” Two weeks after Annabi voted, Jereis sent two emails to Forest City. “I appreciate the movement on the contract,” he wrote in one. About two weeks after that, on August 11, 2006, Cantone wrote to a colleague, "What are we doing? I need to get Zehy something fast." Lawyers didn’t ask Cantone about his motivations, but apparently Forest City felt they owed him. Was Forest City aware that Jereis had been rewarding Annabi financially? Jereis did ask for one favor. Because the vote was scheduled for July 11 when Annabi had planned to visit Jordan, Jereis asked if Forest City Ratner would pay the cost for changing her flight. Forest City, knowing it would look bad, said no. According to Cantone, Jereis said "he'll figure it out, maybe he'll pay it himself." Had Jereis not produced Annabi's vote, would Forest City have later hired him? What value did Jereis bring to Forest City? "Besides providing access to Council Member Annabi, nothing at all," Cantone replied. [C]onsider the reaction of the public, the press, and Annabi's Council colleagues if the full truth that came out at trial had been known before Annabi switched her vote on the Ridge Hill Project in the summer of 2006. 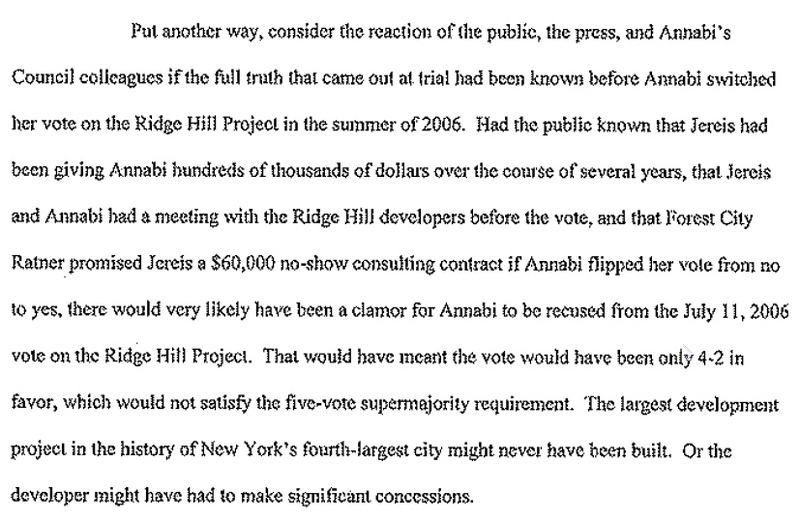 Had the public known that Jereis had been giving Annabi hundreds of thousands of dollars over the course of several years, that Jereis and Annabi had a meeting with the Ridge Hill developers before the vote, and that Forest City Ratner promised Jereis a $60,000 no-show consulting contract if Annabi flipped her vote from no to yes, there would very likely have been a clamor for Annabi to be recused from the July 11, 2006 vote on the Ridge Hill Project. That would have meant the vote would have been only 4-2 in favor, which would not satisfy the five-vote supermajority requirement. The largest development project in the history of New York's fourth largest city might never have been built. Or the developer might have had to make significant concessions. Note that Forest City, according to testimony, didn't quite promise Jereis a job. The Forest City reps were not quite ready to take responsibility when asked who hired Jereis. "The company is a collective," Bender hedged. That prompted the oft-exasperated U.S. District Judge, Colleen McMahon, to ask whether an individual offered him the job. Bender answered obliquely: "Ultimately, it's based on the approval of Mr. [Bruce] Ratner." Forest City actually took until September 19, 2006 to send Jereis a consulting agreement, which--for reasons never quite explained--he didn't return until October 10, along with invoices for three months work. The agreement had been backdated to August 1, 2006, lasting one year, with potential extensions. It was thus worth potentially $60,000, though Jereis got paid only for three months. "You saw nothing wrong with Mr. Jereis's invoices for August, September, October?" Jereis’s attorney asked. However, another Forest City staffer, from the retail rather than governmental affairs department, did blanch at the sparse invoices, with no information about tasks Jereis supposedly accomplished. "It struck me as a little unprofessional," testified John Swagerty. "I think I used the word JV: junior varsity." “I kicked it back to Scott Cantone and told him I needed to see more information to send it to the accounting department," stated Swagerty, who had left more than a year earlier to work for another real estate firm. The revised invoices did come back and, by December 2006, the total value had reached $15,000, covering three months. Beyond the invoices, Jereis had not provided the required monthly reports on his work, nor had Forest City requested them. Cantone admitted he never talked to Jereis about the parameters for such reports. On December 6, Swagerty received an email message from the administrative assistant for Bender and Cantone, sent with the notation "High Importance." "We need to get Zehy Jereis paid ASAP," she wrote. "Can you please expedite? It is extremely important that we get a check." After that $15,000, Forest City never paid him again. The relationship was apparently suspended, but, when news of the federal investigation surfaced in March 2007, Jereis hastily submitted backdated reports, less than half a page. The reports were laughable. They described potential land acquisitions that were far too small for a developer like Forest City, or indicated time-sensitive meetings that were long concluded. Jereis didn’t even write them himself, but enlisted a friend, who testified he helped because Jereis was so computer-challenged he couldn’t create a Word document. The Forest City executives, for reasons unexplained, also fudged their work internally, as meetings with Annabi and Jereis were described in company calendars as occurring with "Friends of Yonkers" or with "consultants." "I don't know why it was coded that way," he responded. While Annabi didn't testify, Jereis decided the only way to survive the trial was to face questions. On the stand, he gamely tried to explain why he spent so much money on Annabi: he had been infatuated with her since the day he saw her in that blue dress. Though Annabi barely reciprocated--he said he’d gotten a few gifts from her and that they’d once had unspecified sexual “contact”--he said he considered her his girlfriend. And $60,000 of the total he gave her was an interest-free loan she promptly repaid. Jereis even submitted a string of emails professing his passion for Annabi, adding another layer of mystery to the case. The mawkish messages had been found in an Annabi computer that a prosecution expert said had been tampered with--though he could not determine whether the emails were bogus. Could Jereis, no digital sophisticate, have managed a computer-related con? Jereis’s personal failings were not a crime, his lawyer insisted. And, the lawyer pointed out, Jereis listed $3.5 million in assets (including income-producing property) in his loan applications, which suggested that he didn’t necessarily need money from developers to pass on to Annabi. Similarly, Annabi’s lawyer allowed that jurors might consider Annabi’s behavior, leading on a sugar daddy, was reprehensible, but it was no crime. The contours of that behavior remained murky. Mangone testified that Jereis told him that Annabi was “hounding” him for cash during the summer she voted on the two projects; Jereis denied that. But mixed motives do not make a get-out-of-jail-free card, prosecutors stressed; even if Jereis’s spending was partly motivated by friendship, it didn’t absolve him legally. Other evidence militated against the “love” defense; after all, Jereis’s checks were written on the account he shared with his wife and he wasn't exactly giving her chocolates and flowers. (Jereis paid for two pieces of jewelry, but Annabi bought them herself. She initially told the FBI that she couldn't recall who paid for it.) Fundamentally, prosecutors argued, Annabi never disclosed the payments on City Council forms and denied, when questioned by a colleague, that she’d ever gotten anything from Jereis. And Jereis proved to be a very unreliable witness: he denied asking Spano about jobs "for the Republican leadership" and denied telling Cantone that he was "quarterbacking" the Longfellow project for Annabi. Given the complexity of the case, including additional charges against Annabi of mortgage and tax fraud, it wasn’t surprising that jurors took more than four days to reach a verdict. The jury apparently found the defendants too fishy, notwithstanding Jereis’s explanation, and Mangone’s extensive but sometimes very wobbly testimony--defense lawyers caught him claiming he got the Longfellow bribe on the day the bribers were in Mexico. The defendants, asking for the verdict to be reversed, and for a new trial, have slammed Mangone for unreliability and again argued that there was insufficient evidence of a conspiracy between Jereis and Annabi. Whatever the result, however, Forest City has reason to be unnerved. After the jury’s verdict, the developer issued a statement insisting that “this trial was not about the actions of Forest City Ratner.” Not quite: the departure of Bender and Cantone certainly suggested something was amiss, perhaps a violation of the corporate code of conduct, which bars not merely bribes but "improper payments." After all, Forest City had sent a staffer to watch every day of the trial, and sent several on the days when Bender and Cantone testified. After the verdict, a law professor tracking the trial suggested the decision not to prosecute the developer was a judgment call: while Forest City may have been vulnerable to a conspiracy charge, the evidence was much weaker, and prosecutors apparently calculated that it was more important to convict corrupt public officials than see the effort muddied by an ancillary, weaker case. The Government reiterates what it has said previously that we have no evidence that at the time FCR agreed in principle in or about late June 2006 to hire Jereis after he delivered Annabi's vote, that FCR knew about the corrupt nature of the relationship between Annabi and Jereis. In other words, while FCR knew Jereis had tremendous influence over Annabi at the time, there is no reason to think FCR knew about all the concealed financial benefits Jereis had been giving Annabi for several years. Still, as Gershman allowed, Forest City didn’t come out clean. Nor had the developer been called to account for its strategies. When Annabi’s lawyer suggested that Forest City had won the vote of another Council Member, Pat McDow, in part because of a $10,000 contribution to a drum and bugle corps McDow supported, Bender didn’t deny it. He merely said he couldn’t recall such a contribution. It would not have been out of line for Forest City, which in Brooklyn had funded several community organizations that signed the much-touted Atlantic Yards Community Benefits Agreement promising jobs and housing. Nor had some bigger political fish been called to account, like ex-Senator Nick Spano. Mangone testified that, contrary to his and Spano’s previous statements, Spano did know Mangone had penciled in his name in absentee ballots a decade earlier. Spano, who had recently pleaded guilty to relatively minor tax charges, was not called to testify. Also absent was Albert Pirro. 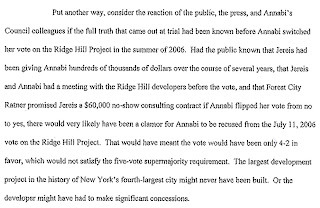 According to former Yonkers Council Member Robertson, Pirro once said he wasn’t worried about Annabi’s vote: it could be secured by hiring Jereis for a consulting job. Defense lawyers got Robertson to admit it was a boast, and that he’d never reported it to the Council. Prosecutors never called Pirro; after all, his criminal record would have been red meat for defense attorneys. Witness Mangone also tossed in a bonus for political junkies. He testified that his law firm, at the behest of state Senator Tom Libous, a Spano crony and top state Republican, had hired Libous’s son Matthew at an inflated salary, and were directed to bill a questionable consulting company to help pay him. Senator Libous initially wouldn’t comment, but later flatly denied it. Could it have been that Annabi and two Spano henchmen were the only Yonkers figures worth pursuing? After the closing statements but before the verdict, local political observer Hezi Aris, writing in the Yonkers Tribune, called Annabi and Jereis “no more than pawns in an opaque tapestry of deceit.” Indeed, the Justice Department said the investigation would continue, leading to speculation that Annabi, if faced with the need to reduce her sentence, might exit Sphinx mode. 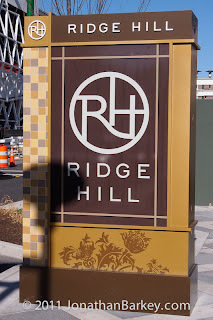 Meanwhile, Ridge Hill--gingerly branded as “Westchester’s Ridge Hill,” as if to avoid tainting upscale outlets like Whole Foods, L.L. Bean, and REI with the name “Yonkers”--geared up for a formal grand opening in April, seven months after the first wave of stores opened. Regarding Ridge Hill, Forest City Ratner had been in damage control mode for weeks. In a New York Times article summarizing three days of the Bender/Cantone testimony, Forest City Ratner spokesman Joe DePlasco complained, as the paper put it, that “critics had focused unfairly” on the firm’s role. “This is really about a company trying with great difficulty to navigate the byzantine maze of politics in Yonkers,” DePlasco insisted. That navigation, however, took them close to the flame. However much Jereis built that byzantine maze, Forest City chose him to create the shortcut and pick off Annabi, rather than dig deeper into its corporate coffers to craft a deal that project opponents thought more fair to the city. In 2010, the state agency overseeing Atlantic Yards was asked if it had discussed the Yonkers investigation with Forest City. “We remain confident in Forest City as a developer and as a good corporate citizen,” an Empire State Development Corporation spokeswoman asserted. A good corporate citizen? That’s a tough one. Bender and Cantone may have since left Forest City’s employ, but they were hardly rogue operators. With Bruce Ratner’s ultimate approval, they did what they had to do, guided by, above all, “the economics." Forest City remains fortunate that few have noticed.